​Explore both the Oceans Below and the Skies Above! Would you rather be a bird or fish? Explore the oceans below and the skies above in one single day! Save up to 20% if booked online today! Explore the marine realm of S.E.A. Aquarium, home to more than 100,000 marine animals of over 800 species. Child price is applicable to children aged 3-12 years. For the purpose of verification, your identification document(s) may be requested by our staff. 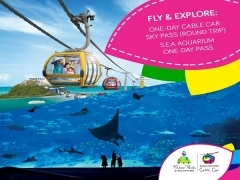 Click here to view or checkout Singapore Cable Car for more details and to book your tickets now!